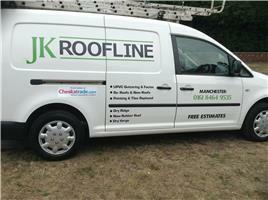 Welcome to JK Roofline, my name is Joe the proud owner. We're a family run business with over 35 years’ experience in the Roofing Industry. Our aim is to ensure a 100% customer satisfaction. We are a friendly and polite team. We believe in quality of work and we will always aim to deliver the best possible job. We are reliable, we will always aim to charge the given price at quotation. We accommodate services for both domestic and commercial clients. You can be rest assured that you are in good hands with our services. Manchester, Stockport, Bolton, Cheshire, Liverpool and all the North West.